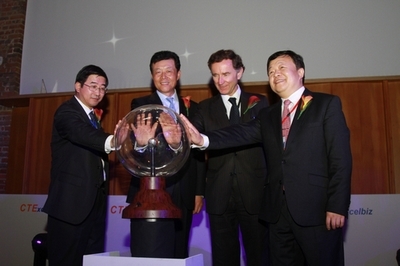 I offer my warmest congratulations to China Telecom Europe (CTE) on the launch of CTExelbiz. 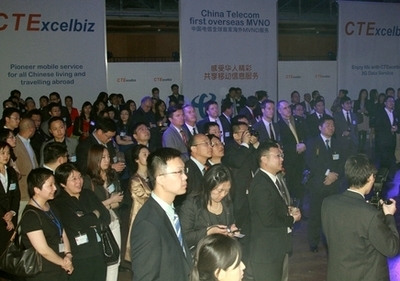 This event means China Telecom Europe is the first Chinese telecommunications operator to launch its own branded mobile service outside China. Last December, I attended the pre-launch of CTExelbiz. In the service demonstration part, I made the first CTExcelbiz phone call. I was impressed by the strong signal, quick connection and high voice quality. However, Managing Director Ou Yan stressed another advantage of this service. That is the low price of CTExelbiz. I believe the cost and quality advantages will make CTExcelbiz immensely popular with customers. China Telecom is a major telecommunications company. It is well established as the leading landline service provider in China. That scale makes China Telecom the world’s largest land line network operator. China Telecom reaches right across China covering giant metropolitan cities and reaching into even the smallest villages. In overseas markets, China Telecom is also expanding. Its voice and data services are now available in every part of the world. I believe the launch of CTExelbiz in the UK has the following three advantages. First, it has made full use of advances in technology. This is the mobile virtual network operator technology, better known as MVNO. MVNO enables China Telecom to combine its strengths with a local mobile service provider. That is why China Telecom has collaborated with the UK mobile business Everything Everywhere. This is the UK’s largest communications company, providing mobile and fixed-broadband communications services to more than 27 million customers. The collaboration with Everything Everywhere will give China Telecom a platform to promote its own distinctive retail mobile services. Let me turn to the second advantage for CTExelbiz in the UK. · About 600,000 Chinese live in Britain. · More than 100,000 Chinese students study in the UK. · Every year 200,000 Chinese tourists and tens of thousands of business people visit the UK. So this is a market of almost a million people. What they seek is a customised mobile service. Also, they want a comprehensive solution for them to communicate between China and the UK. This is where lies the expertise of China Telecom. The third advantage is timing. CTExelbiz has seized a rare opportunity which is the coming London Olympic Games. In two months time, hundreds of Chinese athletes, coaches and thousands of Chinese journalists will arrive in London. On top of this, it is estimated that Britain will receive at least 170,000 spectators and tourists from China’s mainland around the Olympic Games. All these people will need convenient and quality communication with friends and families. I have no doubt that CTExcelbiz will be their first choice. In conclusion, I wish CTExcelbiz a great success! 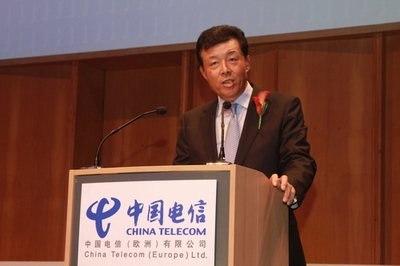 I also wish China Telecom Europe a thriving business!